By the research staff of the Arms Control Association. To get this P5+1 and Iran Nuclear Talks Alert delivered to your inbox, sign-up now. The P5+1 and Iran Nuclear Talks Alert will suspend its daily update until talks resume in August, but will update readers of the latest developments as necessary. In the early morning hours of Saturday, July 19 in Vienna, EU High Representative Catherine Ashton and Iranian Foreign Minister Javad Zarif announced that the negotiations between the United States, other great powers, and Iran to resolve concerns about that country’s nuclear program will continue for as many as four more months. In a joint statement, Ashton and Zarif said the two sides had agreed to extend the interim agreement (also known as the Joint Plan of Action) reached on November 24, 2013 and will resume talks on a comprehensive agreement within weeks–most likely in mid-August in Vienna–with the goal of concluding a comprehensive deal by late-November. “Our negotiators have made progress in some areas and, while real gaps remain, there is a credible prospect for a comprehensive deal. Because of this – and because Iran has upheld its commitments under the initial accord – we agreed today to extend the Joint Plan of Action to November 24,” President Barack Obama said in a statement. “This extension will allow us to continue the negotiations while ensuring that the progress of Iran’s nuclear program remains halted during the negotiations,” he said. On July 19, the State Department announced additional measures that would be undertaken through the extension of the interim agreement that provide additional nonproliferation benefits. In the agreement, Iran diluted half of its 20 percent enriched-uranium hexafluoride gas and converted the rest to oxide. Iran has now committed to make all of the 20 percent oxide into fuel for the Tehran Research Reactor. Twenty-five kilograms of this material will be converted into fuel by the end of the extension. This will make if far more difficult to use this material for further enrichment to weapons-grade. In return for these steps maintaining its original commitments under the interim agreement, Iran will be allowed to access $2.8 billion of its restricted assets, the four-month pro-rated amount of the original interim agreement commitment. These ongoing restrictions on Iran’s nuclear program and additional steps are a net-plus for nonproliferation. While the goal remains a comprehensive, long-term deal, it is clear that the interim agreement has been a significant success without which Iran’s nuclear capabilities, including its stockpile of 20% enriched material and total number of installed centrifuges, would have been far larger and more worrisome. For the next couple of weeks, the respective P5+1 and Iranian negotiating teams will return to their capitals for consultations, review the gaps between the two sides, and evaluate how those gaps can be bridged in the coming round of negotiations over the next four months. Our assessment that a comprehensive agreement to ensure that Iran’s nuclear program is entirely peaceful is still within reach if both sides remain focused and if both sides engage in creative, innovative, and smart diplomacy. Progress has already been achieved on several key issues. such as: strengthening International Atomic Energy Agency (IAEA) inspections and oversight at all of Iran’s nuclear sites and related facilities; modifying Iran’s Arak heavy-water reactor to drastically cut its plutonium output; and an understanding on the phasing of sanctions relief. However, the two sides have more work to do to bridge differences on the most difficult issue: limiting Iran’s uranium-enrichment capacity over the duration of the multi-year comprehensive agreement. Negotiators can square the circle with a combination of additional measures that should be acceptable to both sides. These measures would substantially increase the time Iran would need to produce enough weapons-grade material for one bomb and still would provide Iran with more than sufficient capacity for its civil nuclear program. Last week, David Sanger reported in The New York Times that Iranian Foreign Minister Javad Zarif said Iran is willing to negotiate on a uranium-enrichment proposal that would freeze Iran’s current capacity (10,200 centrifuges – or about 9,000-10,000 SWU) for several years. The Zarif proposal certainly falls short of what it will take to reach an agreement, but it represents an Iranian attempt to find a compromise formula on the key sticking-points and it stands in stark contrast to earlier statements about Iran’s growing uranium-enrichment capacity needs. It is vital that the P5+1 respond with similarly creative and innovative ideas that adequately reduce Iran’s capacity to make a dash for nuclear weapons before any such effort can be disrupted. Limiting uranium enrichment to levels of less than five percent and keeping stocks of its enriched uranium gas to near zero levels. Limiting Iran’s enrichment capacity for 10 years at, or below, its current capacity and allowing for appropriate increases in Iran’s uranium-enrichment capacity at a later stage if Iran provides sufficient information to the IAEA to prove that any past experiments with possible military dimensions have been discontinued. Agreeing to phase out, remove and store under IAEA seal Iran’s less efficient, first-generation IR-1 centrifuges and, over a period of years, replace them with a smaller number of more-efficient centrifuges. During the transition period, the total operating enrichment capacity would be held below agreed limits, ideally less than Iran’s current capacity. This would allow Iran’s scientists to make the desired transition to more cost-effective machines over time, but still constrain Iran’s overall enrichment capabilities. Agreeing not to assemble and operate the more-efficient centrifuges until there is a demonstrable need for commercial-scale enrichment. This would increase the time it would take Iran to operate the machines, and provide added insurance against rapid breakout scenarios. Providing strong P5+1 nuclear fuel-supply guarantees to Iran to help meet its future nuclear energy and research needs. Such guarantees could include pre-delivery of fuel for Iran’s Bushehr light-water, electricity-producing reactor before the current fuel-supply contract with Russia ends in 2021. Working with Iran on joint scientific ventures to help Iran develop the technical means to indigenously produce fuel for the Bushehr reactor and possible other electricity producing reactors that may be built in the future. These measures would substantially increase the time Iran would require to produce enough weapons-grade material for one bomb to 12 months or more and still would provide Iran with more than sufficient capacity for its civil nuclear program. When negotiators from the two sides reconvene in mid-August at Vienna’s Coburg Palace, they will need to engage is pragmatic discussions on these and other approaches if they are going to bridge the uranium enrichment gap. –-DARYL KIMBALL, executive director in Washington, DC. Although the arguments against Iran maintaining an enrichment capability are sound from a nonproliferation perspective, the prospect of achieving such an outcome through negotiations or any other means is not realistic at this point. Iran clearly will not give up such a capacity willingly and there are no credible options to forcibly eliminate such a capacity from Iran altogether. Furthermore, “dismantling” Iran’s Fordow centrifuge facility and the Arak heavy water reactor project are not necessary to neutralize their proliferation potential. Verified repurposing of Fordow to ensure it does not operate on the industrial-scale and modification of the Arak reactor design to neutralize its plutonium production potential are realistic and possible. Additionally, the November 24 interim agreement stipulated that a final deal will allow Iran a limited uranium-enrichment program based on its practical needs. Insisting on a zero-enrichment result would violate the agreed-on parameters of a comprehensive deal and is not necessary to prevent Iran from obtaining nuclear weapons. Demanding that Iran “dismantle” its illicit nuclear infrastructure may sound tough, but it’s the kind of language that can undermine the conclusion of an effective, comprehensive deal. Since the original Joint Plan of Action took effect on January 20, 2013, the International Atomic Energy Agency (IAEA) has issued a series of short reports verifying that Iran has met its obligations under the interim agreement. According to the latest monthly IAEA update released over the weekend, Iran has started-up a long-delayed facility to convert some of its lower-grade (3.5%) enriched uranium gas into oxide. The IAEA report says that Iran has already fed about 1,500 kg of the material into the conversion process, as was originally agreed in November 2013. Iran’s past nuclear efforts are among the many thorny issues in the continuing Iran nuclear talks. Instead of insisting on knowing everything about what Iran’s nuclear program looked like 10 years ago, the United States, its allies, and the International Atomic Energy Agency (IAEA) should focus on preventing Tehran from building a nuclear weapon in the future. Though discussions between Iran and the IAEA are proceeding in parallel to the six-power nuclear negotiations with Iran, some argue that Tehran must “come clean” on past military experiments before it can be trusted to make new commitments. However, reaching and implementing a nuclear agreement should not be held hostage to resolving all the complicated questions about the possible military dimensions of Iran’s past nuclear programs. We have good reason to believe Iran has been engaged in prohibited activities. In 2007, the U.S. intelligence community issued an assessment that, for a number of years, “Iranian military entities were working under government direction to develop nuclear weapons.” The intelligence also indicated that these activities had ended in the fall of 2003. In November 2013, Iran and the IAEA finally reached a framework agreement for moving forward to resolve outstanding concerns. This includes 18 actions that Iran must complete in three installments before August 25. So far, Iran has carried out the required actions, including providing information about its work on explosives. This is an important step. However, it is too early to judge the adequacy of the information provided or the degree of success follow-up discussions will have in allaying suspicions of weapons-related activities. In the end, the IAEA is likely to report its assessment of Iran’s past nuclear program without Tehran’s endorsement. Even when there is agreement that certain activities occurred, Iran may have alternative explanations. This will not be an ideal outcome, but it also need not be a deal-breaker for the nuclear talks between Iran and the six powers. Persuading Iran to reveal its past militarization activities could yield valuable information for creating a monitoring system as part of a comprehensive deal. It would enhance our understanding of Iran’s nuclear program today and build confidence in the IAEA’s ability to monitor it in the future. The success of the comprehensive deal in preventing Iran from building nuclear weapons depends first on the degree to which Iran’s future nuclear program is transparent and second on the extent to which its “breakout” capability is limited. Achieving an Iranian confession of past sins is not going to happen, nor is it essential to preventing Iran from building nuclear weapons. What is essential are strict limits on Iran’s nuclear capability and intrusive verification and monitoring of Iran’s current and future nuclear activities. *For Thielmann’s full analysis, see “Gettting to ‘Yes’ On the Iran Deal,” July 16, 2014 in Reuters. August 15 (est.) 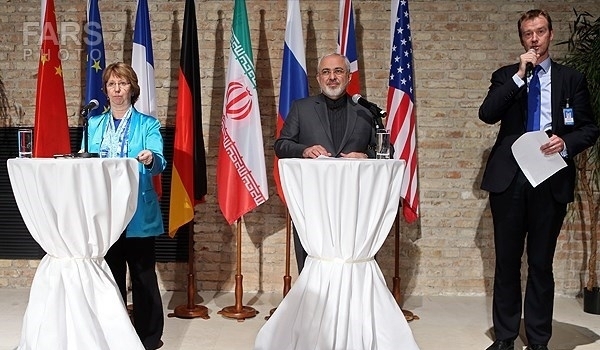 – possible resumption of P5+1 and Iran nuclear negotiations. August 24 – deadline for Iran to exchange information with IAEA with respect to the allegations related to the initiation of high explosives, a technical visit to a centrifuge research and development center and information and managed access to centrifuge assembly workshops, centrifuge rotor production workshops, and storage facilities, and the conclusion of the safeguards approach for the Arak reactor. November 24 – target date for the conclusion of the comprehensive nuclear deal. This entry was posted in The P5+1 and Iran Nuclear Talks Alert and tagged #IranTalksVienna, IAEA, Iran Nuclear Program, Iran sanctions, Joint Plan of Action, P5+1 Iran talks. Bookmark the permalink.